Some horror movies put their bad guys in cars. Sometimes, the car is the bad guy. And occasionally, the car's just there to help out. Here are the top tencommenter-chosen horror movie cars. What&apos;s your favorite horror movie car? Why It's Scary: A crazed madman goes on a killing spree, murdering women in his Cadillac Eldorado. When he kills Rennie Cray's wife, Cray takes off after him in a 1968 Barracuda. They meet, head on, putting Cray in jail and the madman in the hospital. He emerges with a number of prosthetic limbs and builds himself into his car, continuing his murderous ways. Eventually, the two meet again for the nail-biting conclusion. Why It's Scary: In Alfred Hitchcock's classic The Birds, Tippi Hedren attempts to make her escape from the evil fowl, only to be (once again) stymied by their evil, flocking ways. After filming, the Aston was purchased by a Los Angeles resident, who had a Corvette motor and automatic transmission installed. It was eventually restored, (with damage from the movie shoot preserved) but met its end when it was totaled some years later. Why It's Scary: I can hear you all now: "But Shaun of the Dead isn't a real horror movie! It's got Simon Pegg and Nick Frost! It's a comedy!" Look. See hoards of zombies? See a ragtag band of survivors trying to make it to a safe house? (Don't worry that the safe house is actually a pub.) In my book, that makes it a horror movie. The Jag has only a bit part, but it's an important one: Shaun's mother's boyfriend Phillip meets his demise inside. Why It's Scary: Like Shaun of the Dead, some folks might not consider Ghostbusters a real horror movie, but others are genuinely freaked out by those gargoyle dogs, so ECTO-1 earns a spot on our list. Originally a 1959 Cadillac Ambulance, ECTO-1 underwent some pretty intense customization and hotrodding to become the ghost fighting machine we all know and love. Why It's Scary: The Oldsmobile Delta 88 was director Sam Raimi's personal car in high school, and its quad-eyed, thousand-yard stare has made appearances in all of the Evil Dead films. Eventually, it gets body armor and spinning death blades attached to it, and even travels through time. Why It's Scary: The star of cult classic The Car began its life as a 1971 Lincoln Continental Mark III, but was customized by famed movie car maker George Barris. In total, six Continentals were The Car, with a seventh built for an amusement park and then sold to a private collector. Only one example remains, which is good, because if it ever comes to life and tries to kill innocent bystanders, it'll be easier for James Brolin to deal with only one evil car, not seven. Why It's Scary: The Gladiator in Tremors is driven by Kevin Bacon's character Val until its tires get eaten by one of the giant, angry worms, or Graboids. For Tremors 2 the truck is back, with different markings on its side. That truck is actually the remains of three other Gladiators all combined because the producers for the film couldn't find another one for sale. Why It's Scary: From now on, if I ever see a giant Chevy van like the one from Jeepers Creepers I'm running. I like my eyes in my head and attached to my brain, where they belong, thank you very much. There is no way anyone could get me to stay with that thing around. This movie completely ruins the 1941 Chevrolet Cab Over Engine for anyone who sits down to watch it. Why It's Scary: "Stuntman" Mike has a thing for big, scary muscle cars. He starts the film with a 1971 Chevy Nova, but after his first run-in with a trio of beautiful women he switches to a 1969 Dodge Charger. Both cars on their own are not particularly terrifying, but when "Stuntman" slides behind the wheel, they instantly become killing machines. 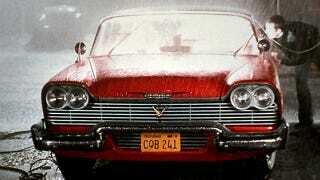 Why It's Scary: Christine, from the movie based on the Stephen King novel of the same name, was a 1958 Plymouth Fury. In that year (and that year only) a 350ci V8 was available, which got the car from zero to 60 in a quick 7.7 seconds. (Evil, personality-altering effects were not noted during the test.) Christine is the most famous car of the Fury line, although the Plymouth would get another starring (but less terrifying) role in the 1971 film The French Connection.